Back pain due to a herniated or bulging disc can be debilitating, and in the past, surgery was the answer. Today, we have highly-successful advanced technology that allows us to relieve this pain without surgery. We use a system that combines a machine with an exceptionally precise computer program for a treatment called spinal decompression. 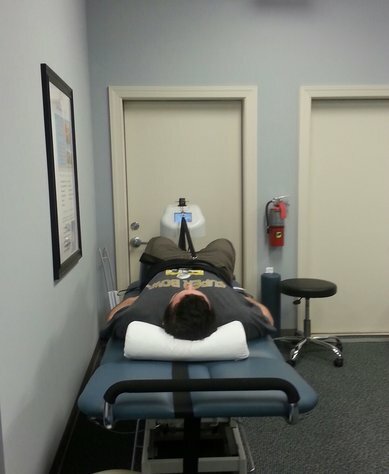 Using this computer technology and the decompression machine, we are able to create a custom treatment plan that decompresses the spine and pulls the herniated or bulging material back into the disc. The computer program is created and supervised by one of our highly trained staff. It gently stretches and relaxes the spine in rotation, which, over time, separates the vertebrae. This creates a vacuum-like effect that pulls the soft bulging disc material back into the disc. This can not only clear up back pain, but also any pain caused by the pressure put on the nerves. For example, patients who have a herniated disc in the lower back may have shooting sciatic pain down their legs. Relieving the herniated disc will cause that pain to vanish.